On Monday, I was watching tv with Baby Girl when I heard a loud scratching noise. I looked outside but saw nothing. Then Mr. Pikko came home. He called me outside and I went out and to my horror, Max had climbed up on a plastic bin and proceeded to dig up my planter, which contained a little, struggling alpine strawberry plant I’d been nursing for almost two months, tons of newly sprouted strawberries, and three I’d spent two weeks babying indoors but transplanted on Sunday. All that remained of all my hard work was a bunch of tiny little sprouts by the wall that he couldn’t reach in his furious digging. I was truly and completely devastated. I’d been looking at those plants every morning since February and now they were gone. I went to look at my gardening log to see just how long ago I’d planted them and when I saw the date, the tears just came flowing out. I sobbed on the couch at the loss of all my work. I sobbed for my two boisterous zucchini plants that he ate into stumps. I sobbed for the two blueberry bushes that cost me $12 each into stubby clumps of sticks. And then Baby Girl came to hug me. She offered to get me tissues, then kindly took them away. She came back and hugged me and promised she’d help me plant more. Buddy came by to hug me and tell me that Max was a bad boy. Their compassion helped me feel better and I’m glad I no longer have inconsiderate children of stone! A new Scarecrow is on the way and my exposed blueberry bush is covered in netting. I plan to start new strawberries tomorrow. As I was writing up a title for today’s post, I realized that I pack a whole lot of tonkatsu bentos. Not quite 4,524 but it’s still a ton! The onigiri were three plain salted ones that I made small to fit nicely inside the box. Mr. Pikko has a ton of bolting lettuce right now and so I’ve been given permission to pick as much as I want for bentos, though it’s much too bitter to eat. 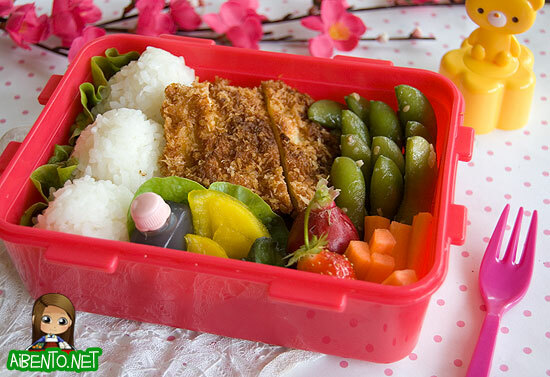 Still, it’s nice to have an infinite supply of bento border without having to buy and store it in the fridge! Next to the tonkatsu I have some garlic edamame, little carrot sticks, a radish I grew, a strawberry from the garden patch, pickles, takuan, and a bottle of Ikari Tonkatsu Sauce . Buying 15 bottles of Ikari tonkatsu sauce sounds ridiculous, but if you tasted the stuff, you might think again. Especially since it comes out to be only $4.39 a bottle, which if I remember correctly, is better than the local sale price. The radish was freakishly spicy. After looking it up, I learned that inconsistent watering (which caused a lot of my radishes to fail to form bulbs) can cause radishes to become extremely spicy. Still, I felt like I had to eat it since I’d grown it, so down it went, throat fire and all. I have a new batch of radishes that are supposed to be ready already, but they sure don’t look it.